45 rockets, mortars fired towards southern Israel. Three explode in communities in the Eshkol region. Gaza terrorists fired a barrage of 45 rockets and mortars at southern Israel overnight Tuesday. The IDF said that seven rockets were intercepted by the Iron Dome anti-missile system and that at least three rockets missed their mark and landed in the Gaza Strip. 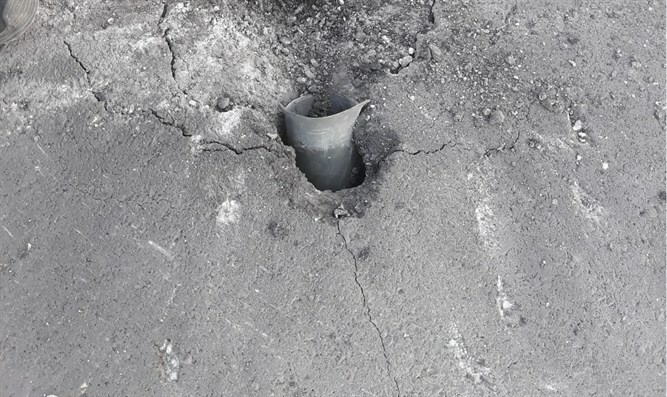 Three rockets exploded inside communities in the Eshkol Regional Council. There were no physical injuries but buildings sustained damage. 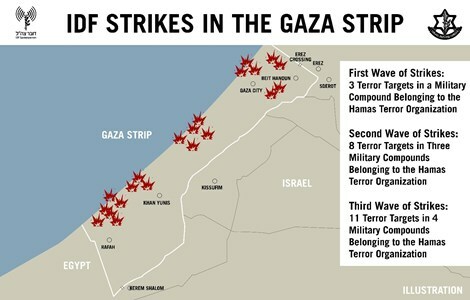 The IDF attacked targets in Gaza three times during the night. In the third air strike, shortly before 6:00 a.m., IDF forces attacked 11 terrorist targets in four military compounds belonging to Hamas, including an underground training facility. 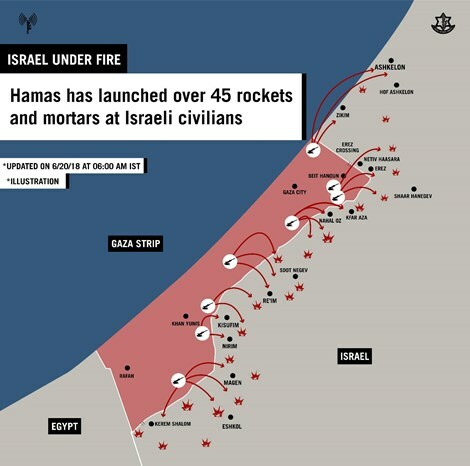 The IDF Spokesperson's Unit said that to this point, IDF forces have attacked 25 terrorist targets in the Gaza Strip in response to the high trajectory fire that was carried out overnight from Gaza into Israel. Earlier on Tuesday night, the IDF attacked eight terrorist targets in three military compounds belonging to the Hamas terrorist organization in several locations throughout the Gaza Strip. The attack was carried out in response to high trajectory fire from the Gaza Strip towards Israeli territory. "The Hamas terrorist organization is responsible for everything that is happening in and out of the Gaza Strip, and it will bear the consequences for the terrorist acts carried out against the citizens of Israel. The IDF is prepared for a variety of scenarios and is determined to continue its mission to protect the citizens of Israel," the IDF Spokesperson said in a statement. In the first air strike in Gaza, IAF fighter jets targeted three military targets in a Hamas compound in the southern Gaza Strip. The strike was conducted in response to the repeated launching of incendiary kites and balloons with explosive devices attached to them from the Gaza Strip into Israeli territory. “The IDF is prepared to continue operating with increased intensity and with various means in response to these terror attacks,” said the IDF Spokesperson’s Unit. On Monday, an IDF aircraft targeted infrastructure belonging to the Hamas terror organization in the southern Gaza Strip after a group of terrorists launched arson balloons from nearby into Israeli territory. The strike followed air strikes against nine Hamas positions in Gaza which were carried out early Monday morning.